Editor’s note: Korari is 42 and illiterate and cleans houses in Kabul to help earn money for the family. Kabul — I live in Kabul and I am illiterate but I have many skills. I can make handicrafts and work as a tailor but my family is poor and by working in a house I am able to help earn money for my husband and children. About gender violence, if a mother is a real mother she will see both boys and girls with one eye. After keeping a baby in her belly for months this is how she feels. I might give more love to my daughters because I want to give them happiness now as who knows what the future will bring and what kind of family they will live in. My husband gives more value to his sons. In our family we always provide the same opportunity for both boys and girls, but as you know in Afghanistan even educated people do not do this. One of my worst memories is when I got married. My husband already had two sons and one daughter and he told me that I needed only to be a mother for his children and keep them happy because their mother had died. But the children were not good to me and did not let me take the place of their mother and my new husband ignored me. It really hurt when he did not pay attention to me. But I tried hard. Now I have been married for fifteen years and I have three daughters of my own and we have become a happy family. Now in our country I feel like there is no security. There are many attacks. Sometimes this is because of no education and unemployment. In my experience, because I am a breadwinner my husband respects me. I can help him economically and now we have equal rights making the decisions. We are hopeful that peace will come and we will see changes. I know that Afghan women have their rights taken away but even though I am an illiterate woman I fight for my own rights. I want to be a good example for my daughters and show them that no one can do violence to them. The government should help by punishing people who do violence. In our culture we must respect our brothers, fathers and husbands, but sometimes they take one step too far. Sometimes we need to be patient and careful with our words, but I want Afghan women always to be brave and not give up. Gender violence needs to stop. Thank you for letting people hear my voice. 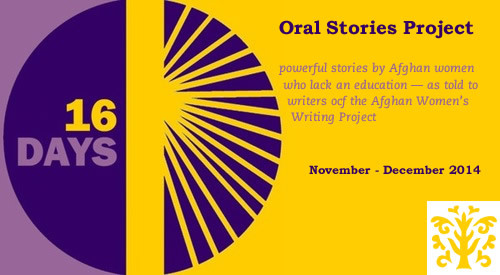 Korari was interviewed as part of AWWP’s participation in the Sixteen Days of Activism Against Gender Violence Campaign 2014.